The Three Gorges Dam claimed the name as the world’s most notorious dam is being built across Yangtze River. Mr. Sun Yat Sen, the founder of Chinese Republic, first proposed the project in 1919. The primary aims of the dam are to alleviate flooding on the Yangtze River and generate power. It was hailed as one of the engineering feats of the 20th century. The dam is located in the areas of Xilingxia gorge, one of the three gorges of the river, which will control a drainage area of 1 million km square, with an average annual runoff of 451 billion m3. The project was begun in 1993 at an official cost of 200bn Yuan ($25bn), though unofficial estimates are far higher. It reached its final height of 185m (607 feet). Fourteen turbine generator units are already in operation. But it will not be fully operational until 2009.It is claimed by Chinese that the dam’s power generation potential is the equivalent of burning 50 million tons of coal or 25 million tons of crude oil. 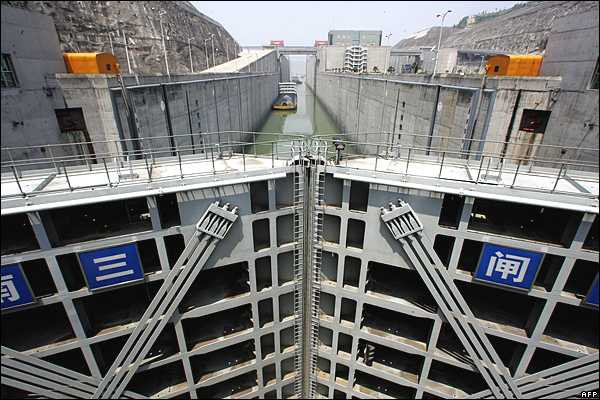 When the dam's reservoir reaches its final height of 175m, scheduled for 2009, the five-chamber ship lock will raise boats by as much as 113m. Now the Three Gorges Dam across China’s mighty Yangtze River threatens to become an environmental catastrophe. The massive project sets records for number of people displaced (at least 1.3 million), number of cities and towns flooded (13 cities, 140 towns, 1,350 villages), and length of reservoir (more than 600 kilometers). Has the Chinese government struck the right balance with the Three Gorges Dam? Read more about the controversy and decide for yourself.